The Google Fit app for Android has received a pretty big update today, which should already be available in the Play Store. Fit, as you may know, serves as the search giant’s integrated health and fitness suite, which can interact with other apps too. 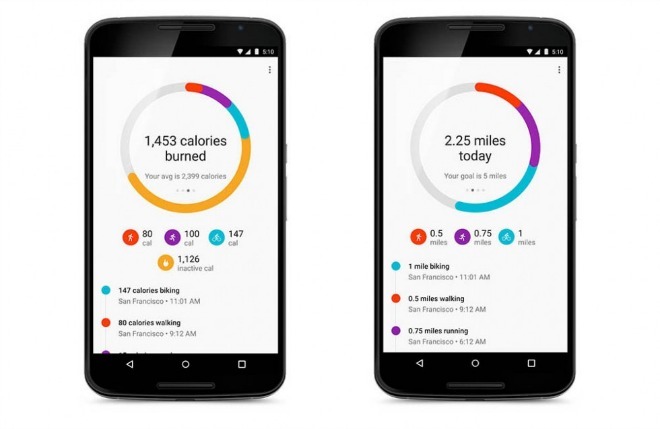 With the new release, Google Fit has received support for estimating distance covered and calories burned. To get this to work, you need to tell it your gender, height, and weight. Then the app will let you know how far you went each day, and how many calories you burned throughout the day and during your workouts. You do however need to keep in mind that these are estimates, and nothing else, so they may be way off (especially when it comes to calories burned). These aren’t the only new features baked into the Google Fit update. You now also get a fitness history view, by scrolling down your timeline. Your activities are grouped by days, weeks, or months. Finally, Fit now has its very own widget, as well as an Android Wear watch face. Both of these let you see how close you are to your fitness goals with just a quick glance – and supposedly keep you motivated in the process.